Home/EMT Salary, EMT Training, Paramedic Training/Is EMT and Paramedic The Same Job? Are EMTs and Paramedics The Same? A common misconception in regards to EMTs and Paramedics is that they are the same thing. While the EMT and Paramedic do share similar jobs, there is a stark difference to each job classification. The difference would be like comparing a doctor to a nurse. While they both work in hospitals and provide a necessary service to the sick and injured, a physician and a registered nurse are completely different in regards to training, expertise, and education requirements. 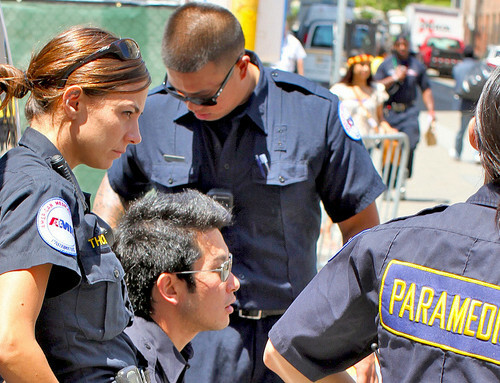 When someone is taking about an EMT, they are usually talking about the EMT Basic. Paramedic is a higher license and is called an EMT paramedic. So for the purposes of this article when we refer to EMT we are talking about the EMT Basic. EMTs and Paramedics are very similar in this regard. They both drive the boo boo bus, they both render prehospital aid, and are usually the first ones on scene in emergency situations. That is where the similarities end. EMTs and Paramedics receive a common core of training however the depth of that training varies. Okay! its not like that! In reality EMTs are trained to handle a variety of medical emergencies. They are trained to identify and treat, or if necessary recognise the need to call for more advanced care. EMTs will be able to render basic first aid, CPR, use and place combitubes and king airways, and use an AED (automated external defibrillator). Basics can also aid patients with taking certain medications such as help them with an albuterol inhaler, take nitro and aspirin. EMTs are able to give Oxygen and use an Epipen for patients that are having an anaphylactic reaction. The variety of Emergencies that a Basic can respond to are the same as a Paramedic however the scope of practice that an EMT is allowed to render aid with is, as the license level is named, basic. They learn the fundamentals in how to stabilize and transport a patient in an emergency situation. The length of training is typically 16 weeks to a year. Paramedics are trained in every topic that the EMT Basic is trained in. Infact, a person wishing to become a Paramedic has to first complete an EMT Basic class. Paramedic level emergency care providers are able to render care at a more advanced level than their EMT Basic counterparts. Medics are able to: Start IVs, administer medication, perform certain surgical interventions, perform endotracheal intubation, use a cardiac monitor, read EKGs, and run a cardiac arrest using ACLS protocols on scene. Infact a Paramedic does exactly the same ACLS procedure that a recess room would do in an ER. Paramedics will actually carry a drug box on their ambulance and are responsible for knowing each of those meds, what they do, their side effects, indications, and contraindications. The length of paramedic training can take 1 to 2 years. Naturally a Paramedic will make more than an EMT basic. The average pay for an EMT basic, according to the graph below, is about $23,000. Paramedic can expect to make the mid $30,000 to $40,000 range when starting. This information does not include overtime pay, which is usually abundant in the EMS field. The job outlook is good to say the least, and if the shortage continues then EMS wages will have to increase in order to entice people to become EMTs and Paramedics. EMTs have the ability gain employment mostly in the private ambulance field. 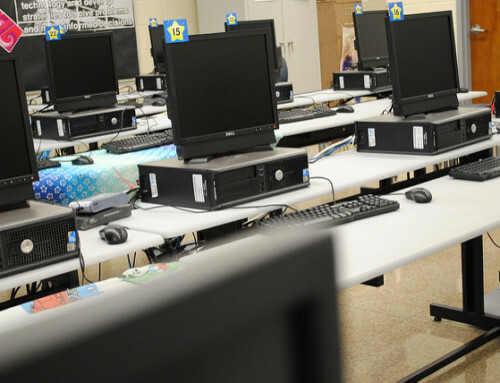 They can also be employed in ERs and hospital floors as patient care technicians. Some fire departments will also hire an EMT if they also possess the necessary fire training. It also is a good resume booster for police officers. EMTs typically work 10, 12, 13, or even 24 hour shifts. Overtime is usually plentiful so the opportunity to make money is limited by how much an EMT is willing to work. Becoming an EMT also has the extra added benefit of giving the Basic a valuable prerequisite in regards to attending school for certain medical careers. For example: Physician Assistants are required to have a certain number of patient contact hours before they can even begin classes. 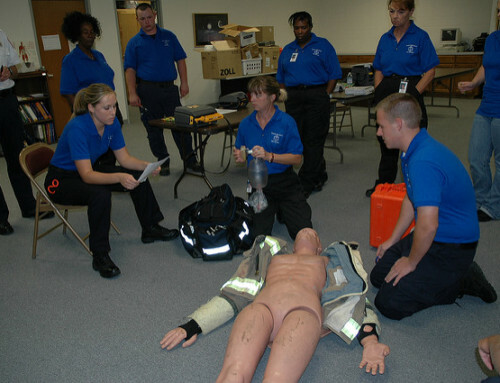 Some programs even require students to have passed an EMT basic course. By having job experience in a patient care field this allows those students a better chance in getting into the highly competitive PA programs. Becoming an EMT basic should be regarded as an entry level medical profession. Like EMT Basics, the outlook for Paramedic jobs is very good. As with EMTs, there is a shortage of Paramedic level emergency providers. Paramedics have the opportunity to gain many of the same employment opportunities that EMT Basics have. However, the Paramedic has some unique opportunities. Paramedics are usually the ones that get hired by Fire Departments over basics, they are also employed in ER’s not as patient care techs but as Paramedics and perform their job functions in an emergency room setting. Employed by various overseas industries, usually for high pay. Employed by municipalities to not only provide EMS coverage but also fight fires. Employed by hospitals and function as Medics in the Emergency room. Employed to work on an air ambulance such as a helicopter or fixed wing craft. Scope of practice is what an emergency provider can and can’t do in the prehospital setting. EMTs are limited in what they can do, where are a Paramedic has a greater latitude in the interventions they can use. The scope of practice that each license level can administer is regulated at the county level in some states or at the state level. For example there are some states that allow EMT basics to start IVs and Intubate, whereas in others jurisdictions this is viewed as a Paramedic level skill. In instances of cardiac arrest, for example, an EMT can use an AED and perform CPR. The Paramedic can read and EKG, start an IV, give Epinephrine, Amiodarone, manually defibrillate and pace patients, etc. In cases of trauma care where an EMT can only splint and bandage, the medic can also start IVs and provide pain medication. Many cities will team up a basic and a medic. The EMT assists the medic and drives while the Paramedic takes care of the patient. The difference between an EMT and a Paramedic is vast. As the name implies, Basic EMTs render basic care and basic life support. Paramedics, also called ALS providers, are trained in advanced life saving techniques and have a greater ability to provide life saving pre hospital care. 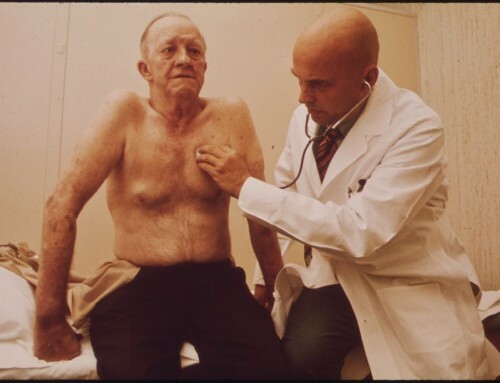 They command a greater understanding of the human body and are a necessary part of the medical system.